I started this in 2012, finished it but forgot to send you a picture. I had “Live well” but changed it to “Love God”. There were a few things I messed up on, but went ahead and just went for it! I figured you and the other people who buy your book would be the only ones to notice. After Christmas I’ll hang it back up. It has a place of honor in my home. Thanks for your lessons in the gray shades of gold for the background. I actually don’t mind one little bit when a quilter changes one of our patterns and makes it her (or his) own. That’s part of the fun of quilting! 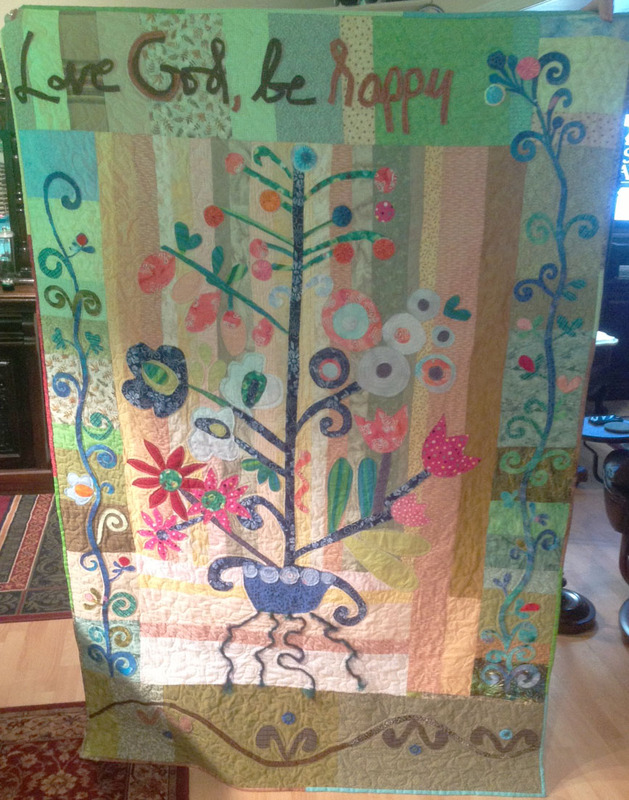 Congrats to Sara for doing just that and for finishing her wonderful quilt! This entry was posted in Quilt Related, Show & Tell and tagged quilt show and tell, show and tell by Becky Goldsmith. Bookmark the permalink. Sara, that’s beautiful! You did a wonderful job. I love your color choice. They are very happy colors. Don’t worry about a couple of boo boos here and there. I’ve been quilting for years and they still pop up in most every quilt. There are mistakes on this quilt? Really? I think it is a very happy, fun design and if there are mistakes I certainly never would have found them! Love this quilt! Love it. Keep up the beautiful work.